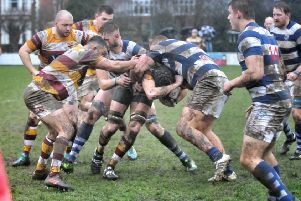 Fylde joined Hull Ionians at the top of National Two North with a 38-7 win at Peterborough Lions. This was Fylde’s first visit to the Lions’ ground and their longest trip of the season. However, with all bar two matches in the division lost to the weather, it meant Fylde had a chance to close the gap on the leading two clubs on a pitch that was, initially, in good condition but became heavy as the frost melted. They exercised their overall superiority on the day, scoring five tries in the process, but only after a gritty performance by the home side who made the Lancastrians fight hard for their bonus point win. The five points see them joining leaders Ionians on 73 points but Fylde are second in the table based on the number of matches won. Saturday’s match started as so many of Fylde’s games have this season. In seven of their previous league matches this season, Tom Carleton has grabbed his side’s first try. It was more of the same at Solstice Park, for it took only two minutes for the 21-year-old to give Fylde the lead. They opened the game by pressing inside the Lions half and Carleton finished off the move off in emphatic style with Greg Smith kicking the conversion for a 7-0 lead. Fylde had most of the possession in the early stages of the game and pressure on the Lions’ pack paid off in the 14th minute when the home side conceded a penalty in their half. Smith converted it well to extend Fylde’s lead before more of the same pressure led to the next score in the 20th minute. Sam Dugdale, starting at number eight in the injury absence of Jacob Conner, drove powerfully to Peterborough’s line and touched down near the posts with Smith adding the extras for a 17-0 lead. Fylde suffered a setback in the 25th minute when Carleton was forced off with an injury and a reshuffle brought Henry Hadfield onto the left wing and Tom Grimes dropping to full-back. 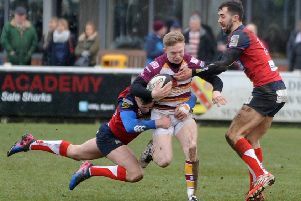 Lions’ fly-half Ben Young was sinbinned a minute later but, with Fylde coming to terms after a realignment of their backs, they were unable to take advantage of the extra player. In the 33rd minute, Fylde flanker Ben Gregory and Lions replacement Martin Lewis were both shown yellow cards by referee Owen Taylor but half-time arrived with Fylde maintaining their 17-0 lead. The second half began in the same fashion as most of the first with Fylde in control. Head coach Warren Spragg, perhaps mindful both of giving game time to players as well as the load on the Sale Sharks dual-registered players, replaced England U20 squad member Gus Warr with Cameron Crampton at scrum-half. They extended their lead in the 43rd minute when the Lions coughed up the ball in midfield. Fylde exploited this remorselessly as Connor Wilkinson broke down the blindside and raced 50 metres to score with Smith’s conversion making it 24-0. With both Gregory and Lewis back in the action, Fylde also took the opportunity to replace Dugdale and Ralph Dowds with Harlan Corrie and James Bailey respectively. The game became a midfield battle on an increasingly heavy pitch and, in the 70th minute, the Lions got on the scoreboard with a try by centre Shaquille Meyers, converted by Young. This was a reward for some hard work as they controlled and recycled the ball effectively. Fylde were still striving for a bonus point try as the game entered the last 10 minutes. Their hard work and focus paid off in the 76th minute as Wilkinson scored his second try with Smith’s conversion seeing Fylde 31-7 up. The fly-half added the gilt to the gingerbread in the last minute when he stepped through the Lions’ defence to score a deserved try. His conversion gave him a match haul of 18 points, and in doing so, cemented his place as the leading pointscorer in the division. Fylde: Carleton (Hadfield 25); Botha, Dowds (Bailey 46), Wilkinson, Grimes; Smith, Warr (Crampton 40); Lewis, Loney (M Ashcroft 78), Ford, N Ashcroft, Garrod, O’Ryan, Gregory, Dugdale (Corrie 46).